Description: The contract foresees provision of consultancy services for the development and implementation of a RBI Management System for Eskom’s 13 coal fired power plants and the Eskom head office. When the South African OHS Act Vessels Under Pressure (VuP) regulations were changed to Pressure Equipment Regulations (PER) in line with the European practice in July, 2009, Eskom familiarized with these regulations and started developing the appropriate compliance strategies for the company. 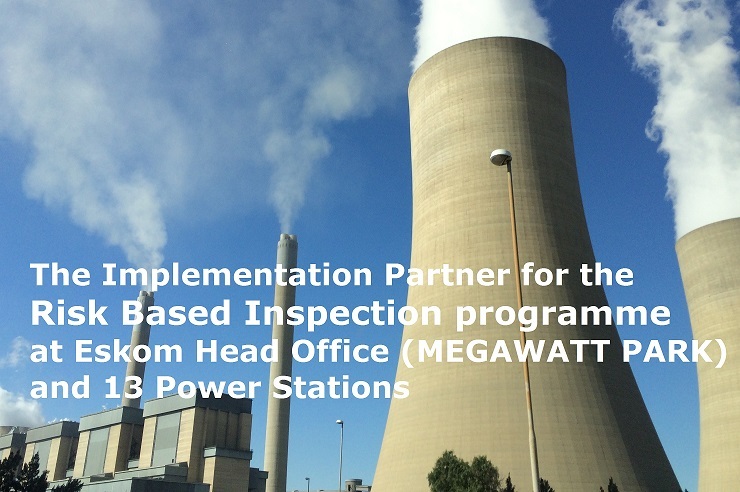 This led inherently to the initiation of the Risked Based Inspection programme. As an alternative to the periodic pressure tests and inspection interval requirements, the PER offers an option of implementing a certified Risk Based Inspection (RBI) programme as part of a plant life cycle management strategy. This involves creating a comprehensive programme for risk based asset management which will benefit both the new-build projects as well as the currently ageing fleet. The compliance will support the business in ensuring that legal, statutory and regulatory requirements are properly understood and best practice is applied in the management of safety and plant integrity risks. Where different technologies exist on a power plant, RBI Programme will be adapted accordingly to cater for the change in technology. -	Enables integration with the overall Asset and Engineering Management Framework of the Employer. -	Defines data requirements and validation best practices. -	Defines a strategy for the selection of systems and components to be considered for analysis. -	Develop suitable RBI programme software for the Employer’s review and acceptance which interfaces with the Employer’s existing systems. -	Defines the limitations of inspection capabilities e.g. intrusive vs. non-intrusive inspection, indicative vs. absolute detection on the determination of the PoF. -	Enables the capturing and management of determination of the degradation mechanisms, rates and failure modes. -	Allows for seamless transition between qualitative and quantitative analysis. -	Enables a standardized approach for the different types of plants and equipment with respect to risk assessment and data capturing as a minimum. -	Enables the determination of the PoF taking into account the remaining life, effect of human error and the operating history, as a minimum. -	Enables the evaluation of the CoF taking into account the safety, environmental and financial consequences, as a minimum. -	Enables multilevel risk analysis. -	Enables the ease of understanding of the RBI processes at all levels of the organization by developing an effective communication strategy. -	Meets the Regulatory Authority’s Certification and Approval requirements. R-Tech Specific Role: R-Tech is the contractor of Eskom and is developing and implementing the RBI system for Eskom HQ and 13 coal fired power plants.